Its been ages since I last baked a Strawberry Shortcake. To me, I seriously don't know which is the authentic, the one with sponge or the one with biscuits? Korean strawberries are on sale. I usually wait for a little longer before I buy them. Reason being the first pick is always not so sweet. Since I gave away half the recipe for the banana cake to D, the remaining loaf didn't last us. So I decided to bake an 8" sponge cake instead. This recipe is fool proof as it uses optima flour as by now you know I do not have much success rate with sponge cake. This time round, I sliced it into 4 layers. Badly in need of practise as I had done such a horrible job. Actually I am so used to frosting with buttercream that now I have problem with whipping cream. Perhaps after I settled down into my new place, I must make an effort to do more layer cakes. Afterall, my family is getting tired of my fondant cakes by now. Now let's talk about shopping. I think I need to buy a cake cover that is small enough to put into the fridge to cover my 8” cake without occupying too much space. All my cake holders are just too big. A good 12" size and it is impossible to squeeze into a fridge that houses milk and other food stuff. See how my strawberries turned wrinkly because this baker is too lazy to glaze it and having it not covered didn't help at all. Another item I wanted to buy is a bread slicer. Anyone know where I can get one at a reasonable price? Okay, I am off to my other new found hobby now. Enjoy. Source: This sponge recipe was given to me by my friend DP so I don't know where is the source. 1 tsp gelatine, bloomed over a 1/2 tbsp hot water. Preheat oven to 180˚C. Greased and lined two 8" round pan. Add all the ingredients into a mixing bowl and beat for about 8 - 10 min till really thick, light and fluffy. Should be in ribbon stage. Pour batter into two 8" tin and baked for 20 – 25 mins. Slice into two after cooled so that you will get 4 layers. Soak gelatine in hot water till it bloom and melted. Whisk cream with sugar till stiff. 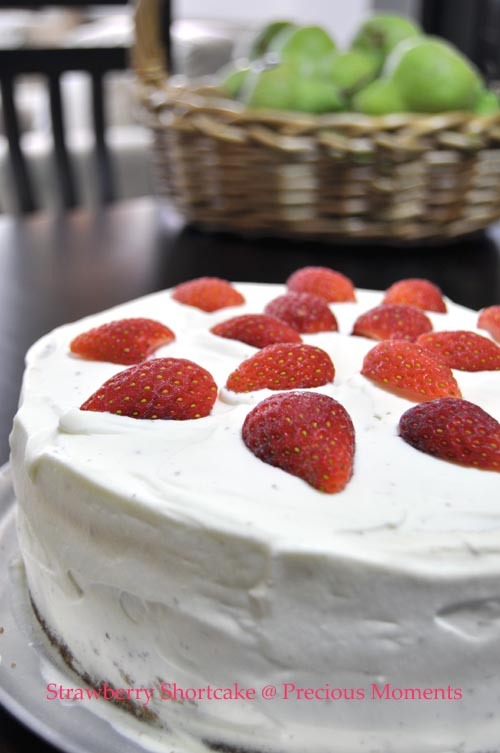 Spread cream over the cake layer, lay sliced strawberries and do the same with the rest of the layer. 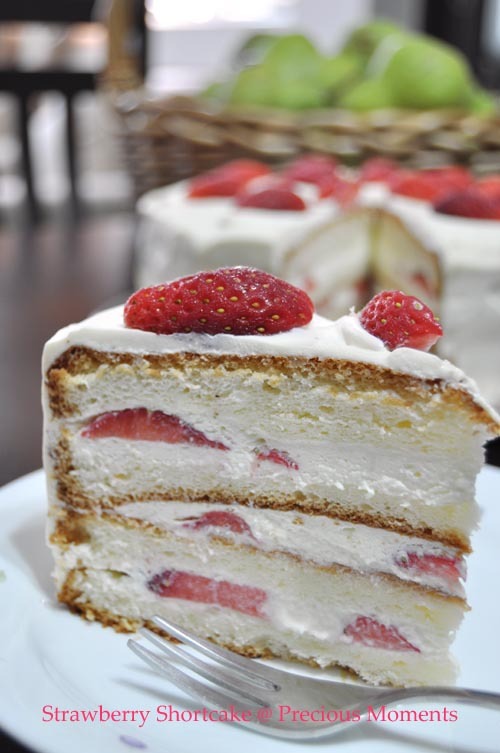 Frost whole cake with cream and decorate with strawberries. Glaze the decorative strawberries with either apricot jam or melted gelatine. I need a slice right now! I bought a bread slice at $9.50 from Kitchen Capers at Kallang Bahru. Not sure whether this is what you are looking for. It looks something like this. I think the sponge version from East (Japan) and biscuit version is from the West. Both just taste as good. Looks lovely, Edith! I need to practice more on making cake layers and decorating too! Bread slicer is pretty expensive. Hope you are able to find the cake cover! hi edith, i think i'm more ignorant than you, i didnt even know that there's strawberry shortcake using biscuits. NOt that horrible looking la, i also need practise on my piping skills. Happy shopping! The recipe is from Aunty Yochana, E!